"A clever romantic comedy from a pro . . . The rollicking plot ultimately leads to romance, revealing this witty story’s warm and fuzzy heart." "[Lipman] has long been one of our wittiest chroniclers of modern-day romance. [Her] writing is brisk and intelligent, and if the plot of this novel is zanier than her usual fare, that too may show just how plugged-in she is to out farfetched times." "The question of who gets to tell one’s own story lies at the heart of Lipman’s smart, sassy, and satisfying rom-com . . . Luckily for fans of contemporary women’s fiction, the answer is Lipman as she once again delivers a tightly woven, lightly rendered, but insightfully important novel of the pitfalls to be avoided and embraced on one’s path to self-discovery." "Lipman’s satisfying latest is a worthy addition to her long lineup of smart, witty novels. . . a charming romantic comedy . . . with a stellar cast of supporting characters [. . . ] and intelligent and lyrical prose . . . A delightful treat readers will want to savor." "Fans of Lipman will cheer for a new novel in her signature style: funny, warm, sharp, smart, and full of love for family, no matter how flawed." "Au courant elements . . . add a fresh twist to the proceedings. Lipman's narrative brio keeps things moving at a good clip." 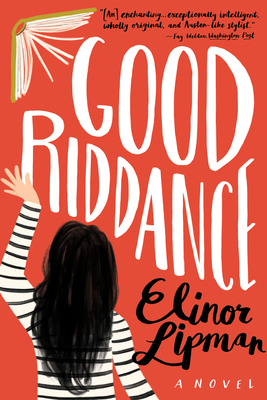 "The sharp, smart wit of Elinor Lipman is a treasure and Good Riddance more than delivers with laugh out loud dialogue, wise social commentary, and thoughtful observations about love."